Ready to set sail on a great adventure? Disney’s MOANA Blu-ray is now available with tons of bonus features, also on Blu-ray 3D™, DVD and On-Demand! This post is sponsored by Disney. May contain affiliate links. Continue the journey with hours of fun-filled extras showcasing an all-new mini-movie, the charismatic cast, famed filmmakers, dynamic musical team, the beautiful people and cultures of the Pacific Islands, a deleted song, deleted scenes, and more! Having an 8 year old little girl really makes me appreciate the “new” generation of Disney princesses that are coming out. I particularly love the character Moana for the diversity, strength, independence, and bravery that she portrays. We first saw the movie at a Disney Parks Blog meet-up at the Disney’s Polynesian Village Resort. It was a magical night! We instantly fell in love with the movie and saw it again in our local theater. The MOANA soundtrack plays regularly in my car. So of course, I am eager to share that MOANA Blu-ray is now available! We couldn’t get it into the Blu-ray player fast enough! Be sure you check out the Things You Didn’t Know About … to meet the stars of “Moana” in this dynamic Q&A featuring Dwayne Johnson, newcomer Auli‘i Cravalho, and famed animation directors Ron and John and to meet the musical team behind “Moana” in this fascinating Q&A featuring Opetaia Foa‘i, Mark Mancina and Lin-Manuel Miranda. There’s also a great feature on the music of Moana. You’ll also learn more about the stars of MOANA, and be introduced to the costume designers and musical team that helped bring the film to life. You won’t want to miss the deleted scenes and deleted song “Warrior Face” – With introduction by songwriter Lin-Manuel Miranda. Hair – One of the greatest technical achievements of the film was the animation of the beautiful, curly hair on Moana and Maui. Take a look at the hair-raising detail that goes into animating each strand, adding performance to the movie that has never been seen before. Having my own curly-haired girl, I just loved watching this. And, don’t forget to go fishing for Easter eggs and check out some great hidden gems by the animators at Walt Disney Animation Studios and the Moana deleted scenes. 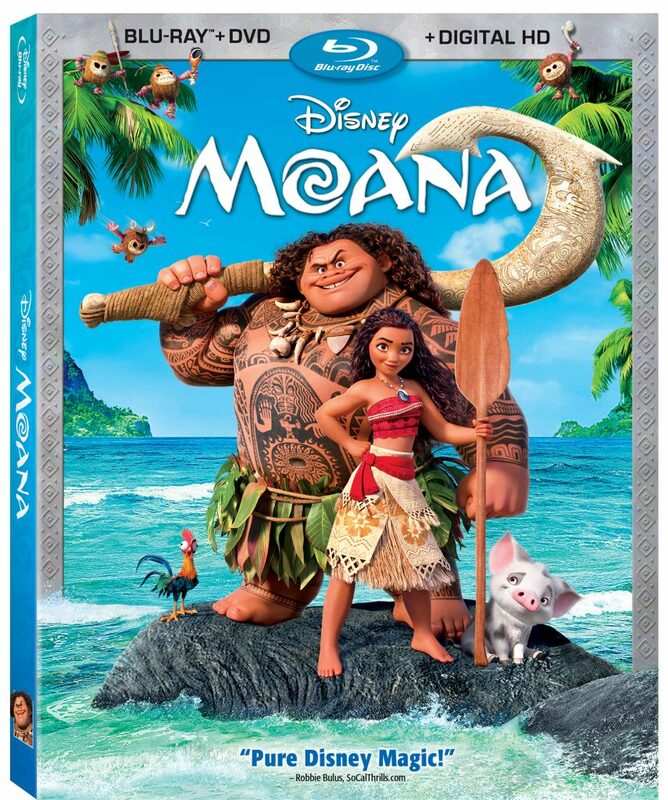 Moana Blu-ray comes with a Digital HD copy for on-the-go! I love having my family’s newest Disney favorite available anywhere we go. 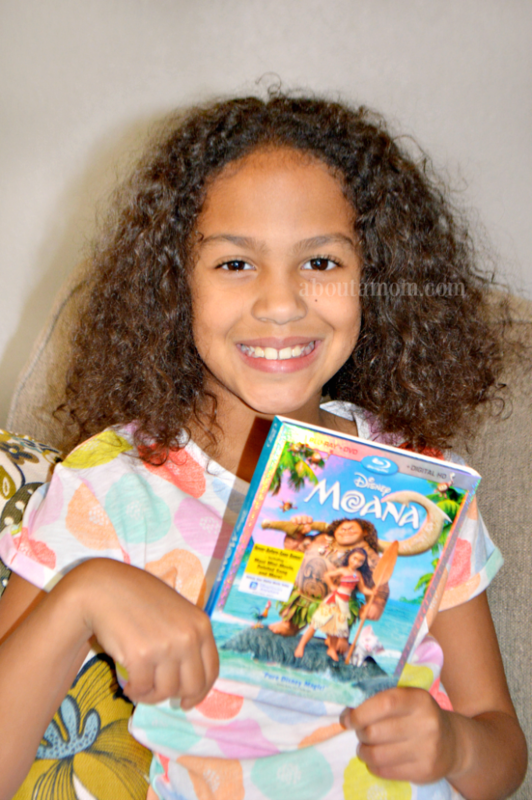 Look for Moana at retailers near you or order from Amazon here. Be sure to pick up a copy so you can belt out “How Far I’ll Go” too, all from the comforts of home. Are you excited to own MOANA Blu-ray? Watch Disney’s Into the Woods on Blu-Ray, Digital HD, and Disney Movies Anywhere! Jurassic World Coming to DVD and Blu-ray on October 20th! We totally missed this when it was in the theater, so I am super excited to finally get a chance to see this. It looks so cute. I missed this one in theatres and have heard such rave reviews. I am so excited to finally watch it (and maybe sing along). Moana is one of my favorite Disney films. I love the strong female lead and the fact that she isn’t running from being a “Real girl”. We saw this in the theater and we all loved it. Auli’i Cravlho and Dwayne Johnson were SO good in it! I didn’t get to see it when it was here so I def want to see this on blu- ray! We seriously loved this movie! The words You’re Welcome will never have the same meaning again. Hurrah it’s out on Blu Ray. I thought that was such a cute movie! I have heard nothing but good things about Moana. I bet everyone will be rushing out to get it on BluRay. Such a cute movie, can’t wait to see Moana. I love how fun and hilarious it looks. I will have to purchase this! My daughter was out sick from school for 2 days this week and she watched Moana while resting here at home yesterday. She loved it and found the music to be especially fun! Our kids saw that movie and loved it! Even the teens and boys loved it! My niece loved this movie in the theater. I should look into getting this for her in blu-ray. We have not seen Moana yet, but we want to. I am glad we are able to purchase it on BluRay now. Your daughter looks like Moana! My 5 yr old cousin love this movie so much and I love it too it was a great animation! The advancements in technology in movies these days is just amazing! As you point out, animating all that curly hair is a marvel, and makes such a difference in the overall visually stunning effects of the movie. We love love loved Moana. We nabbed it as soon as we could so we could sing-along forever. We can’t wait to see this movie it looks so cute and fun. We definitely instead to buy, we missed it in theaters but have heard so many great things about it. These are great reasons to why purchase moana. My kid loves this movie. She loves the song and especially moana. I just recently seen this movie on dvd. This is a really great movie. My grandson loves it.